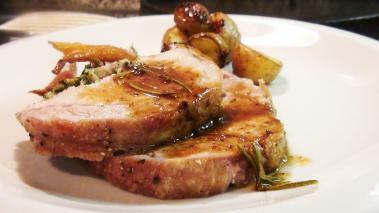 When Sunday rolls around, a Roast Pork Loin, is near the top of my favorite things to cook list. There’s something special about a roast, that gets the whole family together around the table for a “traditional” meal, and while I love roast chickens, roast beef, a roasted pork provides a ton of great options. In this recipe, I’ll show you that treated right, the pork stays tender and moist in the center. And gives you a great, flavorful sear on the outside. Finally, I’ll show you how to use some herbs provide kick it up one more notch. Served along with some roast potatoes, and maybe a simple vegetable side dish, and I’m in heaven. Give it tray, and I hope you enjoy it! The pork loin is a big hunk of meat and needs a good amount of seasoning & herbs, so don’t be shy about using a good amount. Cook the pork to the right temperature. The best way to tell when the pork is done is with a meat thermometer. Once it hits 140 degrees, pull the pork loin out to rest. Pinot Noir is by far my favorite goto wine to pair with roast pork loin. The richness of the pork (especially with the sauce) goes perfectly with the slight tannin in Pinot. And the relatively (relative to say a Cabernet) mild flavor in the wine doesn’t mask the more subtle flavor in the pork. Enjoy! Thanks for showing the finished product on the plate. Your photos are superb and I like the sound of family in the video background.